It all started with the bobbin thread as I had just wound a new bobbin.. This has been going on for quite a while but I finally got fed up and asked a FB group Beginner LongArm Qulters for some advice. 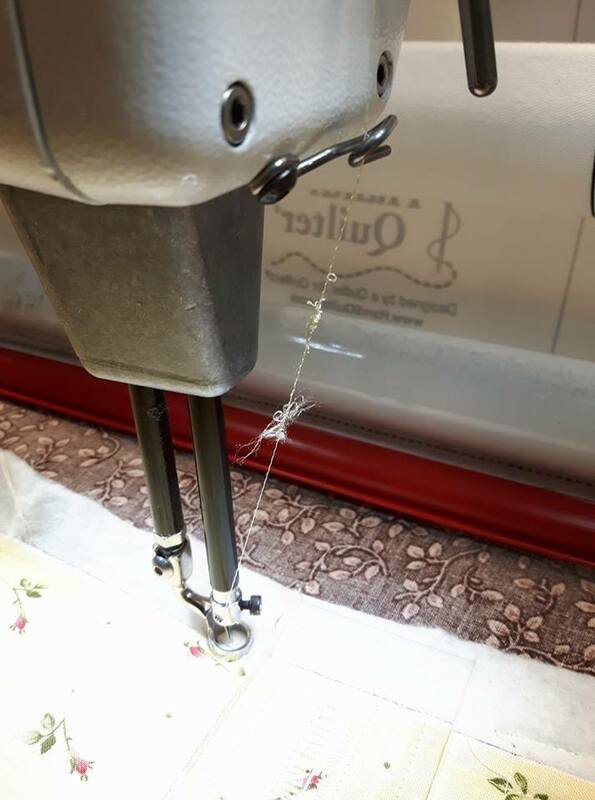 QUESTION: I Have a HQ Sixteen on a frame and could someone please give me some ADVISE PLEASE, each time I change my bobbin and I start sewing (this only happens At the beginning of re inserting the bobbin) it will sew for a few inches then its like the bobbin thread breaks… It quits sewing with bobbin. I have no idea what I may be doing wrong. Its inserted into the bobbin so it unwinds clock wise and the i put it in the slit so it comes out of the spacing for the thread. 3.Check the bobbin tension and that its treaded properly. Border of Charmed Stars using rulers and FMQ Feathers. I got this problem figured out but now the top thread was shredding. QUESTION: I’m working on a hq16 on a frame… my top thread keeps shredding or coming out of the needle I’m not sure wich happens 1st, I’ve changed the needle, retreaded it thru the tension discs everything looks correct. I just purchased the tread at the beginning of September 2017 … Any suggestions on this? Change your needle. I had already done that. Change needle size use larger. Make sure your thread is going through all the tension discs, hooks and eyes correctly. Glide thread is slick. When you stop, it just keeps on going. To counteract, place a small piece of batting in the thread guide above the spool holder. This adds to the friction and slows the thread down just enough. Is the quilt too tight on the frame. Loosen it a bit. Changed needle to bigger size 18. Loosened the tension on the sandwich. It now seems to be working better. I was able to finish the on point background with no issues. Don FMQ around 2 aches n the center. I sure hope this will save some grief for someone else who is experiencing this issue with their long arm. Thank you for your input I hope it will also help someone. Thanks Renee. I have a long arm and my thread brakes. I slowed down and it helps. My big problem is reinserting the bobbin as it is hard to reach under the quilt to reinsert the bobbin. My hand is in the way and prevents me from seeing what I am doing. So I stopped using my machine. I will try again after reading your comments. Thanks. I hope it helps you and please don’t give up it will come.